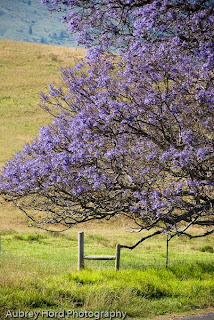 Every Spring on Maui, the rolling hills of upcountry are filled with vibrant purple blossoms of the Jacaranda trees. 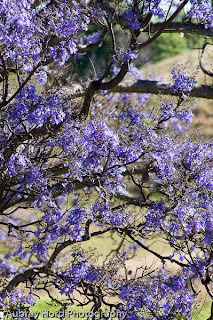 The tree blossoms stay on well into the summer, lending a lavender glow to the hillsides and roadways into Kula, Keokea, Pukalani and Makwao. It is truly a sight to behold especially when the light is just right on the trees in the early morning and evenings. The trees are native to India and the rural legend says were planted upcountry originally to draw visitors to the area and make a scenic byway. They line the upper Kekaulike Highway and Haleakala Highway making the drive upcountry something you will never forget. 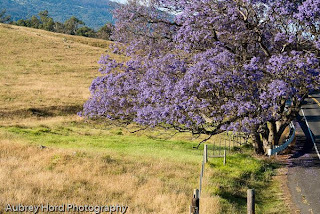 Artists and photographers from all over the world make their way to the area to capture the beautiful purple glow of these trees against the green background of the hills above or the blue background of the ocean below.